I’ve got a new story out for you to read. It’s free, and you can dive into it by going to this link. Enjoy! Once you’ve read it, here are some links of places to talk about it, all of which are likely to contain spoilers. I’ll be doing an AMA about the story on Reddit and I’ll also be appearing on the Wizards of the Coast Twitch stream tomorrow, talking about the story. Back in January this year, Wizards of the Coast approached me. Knowing of my love for their game, Magic: The Gathering, they were wondering if I would be willing to write a tie-in story for them. They mentioned since it was the 25th birthday of Magic, they wanted to do something special—and might be able to splurge on a Brandon Sanderson story. I was, of course, interested—but went back to Wizards with a proposal that I think surprised them. You see, I knew they’d been doing some very interesting things with their stories in recent months. (The multi-part Dominaria sequence by Martha Wells is a good example, if you are interested.) I liked how they were using free stories on their website to both enhance the lore and give some work to talented writers. Once in a while, an idea takes hold of me, and I just can’t be satisfied until I sit down and write it. Skyward was one of those books. Some of the initial ideas had been floating around in my head for years, but once everything clicked together in my mind, it consumed me. I had to write this story and I could not be satisfied until it was written. I abandoned the other book I was working on and started banging out chapters on my laptop, actually writing a big chunk of Skyward while flying around the country on tour. It was as if I—like Spensa, the protagonist of Skyward—had found a broken-down spaceship in a cavern, and I couldn’t rest until I knew what it felt like to fly the thing. Her story was inspired by tales I loved as a child: when someone would find a dragon egg and then raise the hatchling to soar with them in the air. Skyward didn’t really come alive until I re-imagined this style of story in a science fiction setting, taking my own spin on the idea—a spaceship taking the role of the dragon, pointing the story in a new direction. People often ask me my favorite part of being a writer. I have a tough time deciding. I delight in the original inspirations—the beginning of an idea, and imagining what could happen with it in a book. I love writing the first chapters, then love the ending chapters even more. But hands down my favorite part is being able to say, “The book is out and you can read it right now!” That trumps everything else. Hello, all! My new book is coming out next week! Legion: The Many Lives of Stephen Leeds is a compilation of three stories that tie together to form a single narrative. Two of the stories (Legion and Legion: Skin Deep) were available previously, but the third (Lies of the Beholder) is exclusive to this edition. I’d really appreciate it if you would have a look at it, and maybe give it a preorder if it looks interesting. It’s got a patented Brandon Magic System™, only this time applied to a modern-day setting—and in specific, one person’s very unusual way of seeing the world. In conjunction with the book’s release, I thought I’d delve into some of the themes I find interesting (both in writing, and in the way I see the world) that made me write the series in the first place. So I present to you a three-part series of blog posts centered around this idea. I’m calling it Voices in My Head. I have decided for certain that I will be attending FanX (formerly Salt Lake Comic Con). If you haven’t been following the drama, I joined in many other authors signing a letter that challenged the convention to do a better job presenting a safe place for our fans to attend. While FanX has made a number of missteps along the way, I feel encouraged by their progress. I feel that at the very least, FanX will now take complaints seriously—and I feel that my fans can have a reasonable expectation that if an incident does happen, they’ll be listened to. I commend FanX on the steps they’ve taken, and I hope that it isn’t simple lip service, but represents a sincere desire to improve how they deal with harassment at their convention. In any case, I’ll be happy to see many of you there. We should be posting my schedule soon! This, like the Gemmell, is a fan-voted award. So if you feel inclined to vote for Oathbringer, you can sign up at the form on this website. They’ll send you a ballot to fill out, though you need to do this before the end of August to vote. The award does seem to be getting some traction, so maybe give it some attention! As always, however, I strongly urge you to be a thoughtful voter when it comes to awards. Don’t vote for Oathbringer just because I wrote it—only do so if you think this book, in specific, deserves the award. And there are some other excellent nominees, so if you enjoyed one of those more, then vote for it! Adam here. I have some exciting news for those of you in driving distance of Idaho Falls, Idaho. This Saturday Brandon will be appearing at Iona Days just a few miles away. You can see his full schedule below, as well as on his Upcoming Events page, but it will include a short presentation, reading, Q&A, and signing. Those who come to the presentation will be given wristbands that will give them priority position in the signing that immediately follows the Q&A. The Grand Teton Mall Barnes & Noble will also be on site, so if you're looking for a book—including the leather bound editions of Elantris, Mistborn: The Final Empire, and The Well of Ascension—you can find them there. They are also (generously) donating 15% of their net sales to Brandon's Lightweaver Foundation (more on this in a minute); donations that will be matched by Brandon. If you're not able to attend and still want to buy some books (not just Brandon's) while supporting charity, you can use these vouchers in any B&N store on July 21st and 22nd. They will also be active for any B&N online purchases through July 27th. Some exclusions apply. Please see vouchers below for details. Last week, in Tor.com's continuing reread of Oathbringer, Shallan, as Veil, confronted the Midnight Mother in the depths of Urithiru. This week, in chapters thirty-one and thirty-two, Kaladin, near Revolar, upon seeing a group of human's unprepared for an oncoming Highstorm somehow uses Windspren to create a windbreak that allows them get to safety. I found this week's featured cosplay of a Steel Inquisitor, by EHyde, on Brandon's official fansite 17thshard.com. She wrote a little post if you want to know more about it. I don't normally discuss charged issues on my social media, but I do find harassment at science fiction conventions a topic that is very important to discuss. It is also very relevant to my fans, as conventions are often how they interact with me. Adam here. In this week’s new Writing Excuses episode, Character Nuance, Brandon, Mary, Amal, and Maurice talk about characters who have conflict built right into them; characters whose attributes and attitudes might seem to contradict one another; characters who like, y’know… actual people. Last week, in Tor.com's continuing reread of Oathbringer, we jump back in time again, thirty-three years, as Dalinar shows what a warrior armed with Shardplate can do to… well, pretty much anyone without Shardplate. It does have a few disadvantages, though. This week, in chapter twelve, we get to watch Dalinar attempt to play politics, with careful guidance from his wife and various scribes. Why don’t people just say what they mean? The Twitter Archive for April is up to date. In honor of JordanCon next week, here is an excellent Aes Sedai cosplay from The Wheel of Time. I was thrilled when Brandon supported the Indiegogo campaign for merchandise based on Tad’s worlds by buying the map of Osten Ard. I’ve tried to make this the essential map for the series. 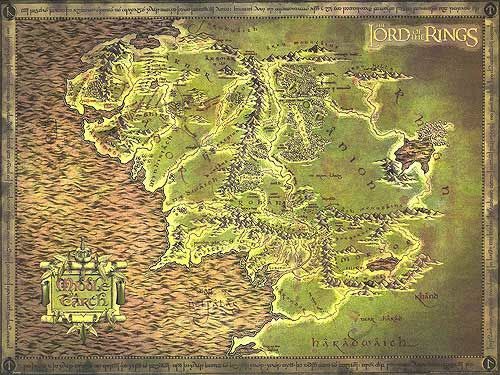 Remember those foil Middle Earth maps from when the movies were big? Well, I was able to get a hold of the original supplier, and that’s who’s printing the Osten Ard map. It’s going to be gorgeous, and the only way to get it is through Tad’s Indiegogo campaign. We might have a few left over after that, but I wouldn't risk it if you really want one. There's only a little over a week left. Last week, we continued on with Kaladin's heart-wrenching homecoming before he headed off to hunt Voidbringers. This week, in chapters eight and nine, we return to Urithiru for disturbing drawings, cooperative cartography, international intrigue, and mystifying murder. 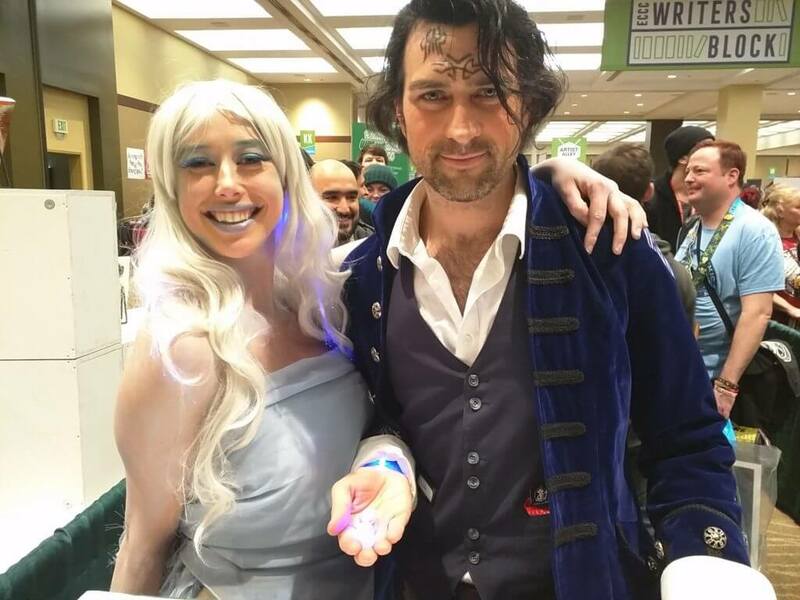 This week's featured cosplay is of Syl and Kaladin from Emerald City Comic Con.